Here’s a picture of the cookies I bought a few days ago in Florence. At the bakery they were labeled “pescatore” but it seems the proper name is “pane del pescatore” which translates to something like “bread of the fisherman”. The cookies stay fresh for a long time so you can take them on fishing trips — or in our case, trips from hotel to hotel. I’ve been eating them all through Italy. I believe their origin is Venice, which would make sense since it’s a city by the water. And from what I’ve read, the nuts vary. 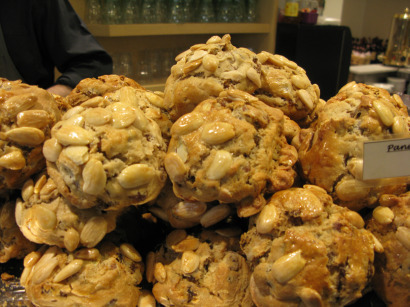 In Florence they were made with almonds, but they are also made with pistachios. The other ingredients are flour, sugar, raisins, baking powder and eggs. The bakery where I bought mine made them in small and large sizes and also carried a chocolate coated variety. Both types are perfect with coffee, and I can’t wait to return home and try to bake some myself. Back and Ready to Bake! Michael, thanks for the comment! I had fun reading it and am now dying to go back to Florence. 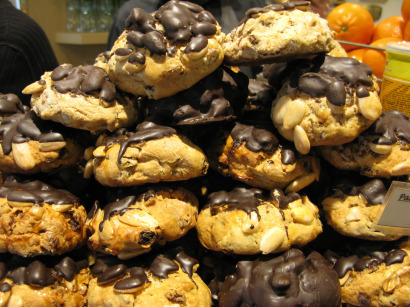 We have limited opportunities to fly to Italy due to the school schedule and budget, but I would love to go back for a third time and find the cookies near the Duomo. Hopefully more people will see your comment and will look for these cookies. Maybe they’ll catch on here in the states. I have yet to see them in Austin, but Austin is definitely not where one would go for Italian pastries ;). I too, went on a “pane del pescatore” search for the BEST in Firenze. I ate several, and would agree with Michael, that the BEST are from the small café which is a stones throw from the steps of the Duomo. Standing in front of the Duomo, with your back to the duomo,, the café would be to your right, about 2-3 little shops up the street on the left side. You can see the pane del pescatore in the window usually. I have been here on every visit to Firenze over the past many years and always buy at least a dozen to bring home. Thanks for the tip and the excuse to return to Florence — to find the best Pan del Pescatore :). This cookie was completely new to me, so I appreciate your input. As for corn flour, I’ll see if I can find some. It’s not the easiest thing to find in American grocery stores, but I could order it off the Internet or possibly grind my own in a flour mill using popcorn. Hopefully, American eggs will do. At any rate, the ones in Italy tasted better than any of the knock-off recipes I was able to find, so I am sure you are right. ,, I was in Firenze (Florenec), the end of February and stayed in a great hotel right near Cafe Maioli,, and the Ponte Vecchio. The Pan del Pescatore at Cafe Maioli, were good,, but double the price at other cafes. Actually I was on a quest to find the “BEST” Pan Del Pescatore in Firenze, and would have to say that it was not at Cafe Maioli. I found much better ones,, and bigger, ( almost double the size),, right near the Duomo in a small cafe. They were only 2 Euro each, and they were fresh daily. The deep rich yellow color comes from the “corn flour” not,, “corn meal” that they are made from, along with the wonderful eggs that are found in Italy. Truly a wonderful treat if it is made right, and authentic. I loved Florence and all it has to offer with museums, food, and just walking around. But I hated the Vespas up on the sidewalks and going down the streets the wrong way. Like a bad Italian movie. 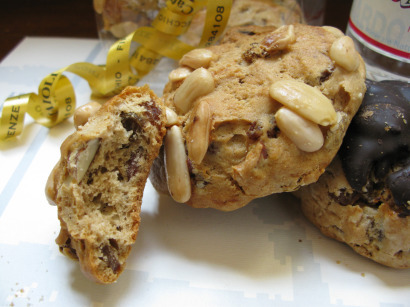 A couple of years ago I made some cookies that looked very similar to these but they had pine nuts. I should dig out the recipe and send it to you to compare. I’m excited for you to try to make these at home too! They look delicious and unique, I’d love to be able to try baking them from a clone recipe. James, it sounds like you bought yours at the same place I bought mine. It’s a little shop just south of the Ponte Vecchio called Caffe Maioli. The people who work there are very friendly and proud of their baked goods. Ram, they look like scones but the texture is drier than most scones I’ve tasted. Based on who makes them, scones come in a variety of textures including cookie-like and biscuit-like, but the scones I know of are more like thick, dense, flakey, biscuits. These were dry and crumbly like cookies. Jenn, that’s what I thought! Luckily these are fish-free. It definitely looks interesting, like a chunky, wholesome sorta scone. MMM, I can imagine it with a good lashing of butter. When I first read it I was like ‘bread that tastes like fish? ?” ew! oh my! those look huge. btw, i had forgotten to add your name to my post on levain bakery cookies, i fixed it. since you had one of the original recipes–at least that’s where I got it from. who did you get it from? oh this is going way back in 2008. Is the texture of Pescatore like our scones? It looks like scone to me with the addition of nuts. I was in Florence this time last year and bought a bunch of those. The shop I got them at was on the south side of the Ponte Vecchio just as you cross the street. I loved it in Florence. I hope you have a great time there and be sure and not miss the two story food market! I spent hours there. These really look interesting, especially the chocolate covered ones.